An unexpected election of Donald Trump as the next president of the United States has far-ranging implications for biotech investors. Image source: Flickr user Jamelle Bouie. Hillary Clinton has not been a friend to biotechnology stocks on the campaign trail, and as a result, investors sold off biotech stocks in anticipation of her winning the presidency. Now that Donald Trump has successfully upset Clinton and won the White House, investors may want to re-evaluate their exposure to this high-growth industry. Will a President Trump be good for biotech stocks? Let's take a closer look at what President Trump could mean for biotech investors. Trump often struck a populist tone on the campaign trail, but even so, he remained far friendlier to the biotech industry than Hillary Clinton. Clinton made waves last year when she called out Martin Shkreli's decision to acquire and sharply raise the price of Daraprim, a decades-old drug used to treat parasitic infections. As part of her healthcare plan, Clinton proposed wide-ranging policies to crimp drug prices and lower healthcare payers' drug costs. These policies included increasing regulation and oversight via caps on patient drug spending, removing tax deductions for drug marketing, and granting Medicare negotiating power. She also suggested requiring reinvestment in R&D, shorter exclusivity periods for biologics, and drug reimportation from countries that pay less for their medicine. Trump has backed Medicare negotiation and reimportation in the past, but he has otherwise been silent on the drug pricing debate. Trump's pro-business stance could mean he'll pose less of a headwind on industry profit, and that could mean that biotech stocks perform better under his leadership than they would have otherwise. Repealing Obamacare is one of Trump's biggest policy positions, and if he follows through with his plans to dismantle the Affordable Care Act, it will have both good and bad implications for biotech stocks. As a refresher, Obamacare created marketplace exchanges through which subsidized insurance plans could be purchased. Over 12 million Americans enrolled in plans via these exchanges in 2016. Obamacare also included a Medicaid expansion provision that was adopted in over 30 states. Over 10 million people have enrolled in Medicaid since Obamacare's launch. The enrollment of millions of Americans in private and public insurance plans since Obamacare's inception has undeniably increased prescription volume and boosted revenue at drug companies. Therefore, unless Trump replaces Obamacare with something "better," biotech companies could see prescription volume shrink as these Americans lose their insurance coverage. The risk of declining volume, however, is only one side of the story. Obamacare also levies taxes on the drug industry that reduce profitability. Specifically, the Branded Prescription Drug Fee levies a tax on drugmakers that's proportional to their market share. A tax target is set annually that must be collected from the drug industry and in 2017, and that target was set to spike to $4 billion from $3 billion this year. Thus a drugmaker with 15% market share of all branded drug sales would be on the hook for $600 million in taxes next year because of this fee. Assuming this fee is wiped away in Obamacare's repeal, it could benefit biotech's bottom line handsomely. Biotech companies could also benefit from Trump's business tax plan. Trump's tax plan calls for cutting the business tax rate to 15% from 35%, so the tax burden on profitable, large-cap biotech companies could be about to drop meaningfully. Trump has also suggested a one-time discount on taxes owed by corporations that repatriate cash held overseas. Under Trump's plan, big-cap biotech stocks with cash overseas could bring home as much money as they want and only pay a 10% tax on it. In theory, this money could be used for stock buybacks that boost earnings per share, dividends, mergers and acquisitions, or drug research. There are likely to be a lot of ups and downs in biotech as Trump formalizes his healthcare plan, but I think his election is ultimately bullish for biotech stock investors -- especially investors focusing on big market cap biotech stocks, including Gilead Sciences (NASDAQ:GILD), Celgene Corp. (NASDAQ:CELG), and Biogen Inc. (NASDAQ:BIIB). Gilead Sciences is a global Goliath in HIV and hepatitis C treatment. It's HIV drugs can cost $10,000 or more per year, and it's hepatitis C drugs, including Sovaldi and Harvoni, are top sellers that can cost tens of thousands of dollars for 12-weeks of treatment. Gilead Sciences shares have fallen this past year as the hepatitis C market has become more competitive, but its sales are still tracking at roughly a $30 billion pace this year, and it has big exposure overseas that could benefit from Trump's tax repatriation plan. In Q3, international sales represented 31% of Gilead Sciences' total revenue of $7.4 billion. Gilead Sciences reported earlier this year that it would owe $9.7 billion in taxes if it brought the $28.5 billion in profits held overseas back into the United States. Celgene and Biogen are also dominant market-share leaders with a global footprint. Celgene is the company behind the expensive, blockbuster multiple myeloma therapy Revlimid, and across its entire drug lineup, Celgene's sales are on pace to eclipse $11 billion this year. In Q3, rising demand resulted in international sales of $1.2 billion, up 27% from a year ago. Meanwhile, Biogen is the biggest manufacturer of multiple sclerosis medicine globally, and its sales came to $3 billion in the third quarter, including over $600 million from international markets. All three of these companies market must-have medicines, so they're less likely to suffer from declining prescription volume stemming from an Obamacare shutdown. The companies will also benefit from big savings if the prescription drug tax is eliminated. Gilead Sciences, for example, had a $405 million accrued liability for this fee in the third quarter. Also, given that all these companies pay a higher corporate tax rate than Trump has proposed, they could see a big bottom-line benefit if his tax plan becomes reality. 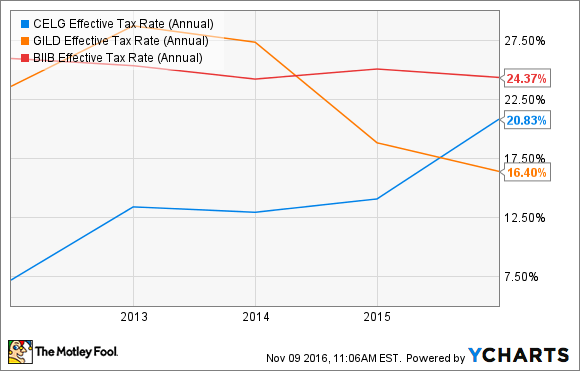 CELG Effective Tax Rate (Annual) data by YCharts. No one knows what the future has in store for this industry. However, Donald Trump's business background and his rhetoric on the campaign trail suggest that he'll be more amiable to the biotech industry than Hillary Clinton would've been. If that proves to be true, then buying biotech stocks like Gilead Sciences, Celgene, and Biogen in the wake of this year's pre-election sell-off could be savvy.